Perfect for traveling, this exceptional Western Mah Jong set (PICTURED OPEN), combines a modern and businesslike look with a strong and durable shock resistant hard shell plastic lockable carrying case. It features an executive briefcase like carrying handle with locking hardware similar to that found in expensive travel hand baggage. The interior of the set is covered in elegant black velour. Everything you need to play is included: 4 colored fluorescent plastic racks, 166 tiles, trays, chips, dice, bettor, instruction booklet and locking key. This set is great for travel and insures endless hours of playing fun for the entire family at a very affordable price. The dimensions of this set are: 19.5 x 9.5 x 4 inches. 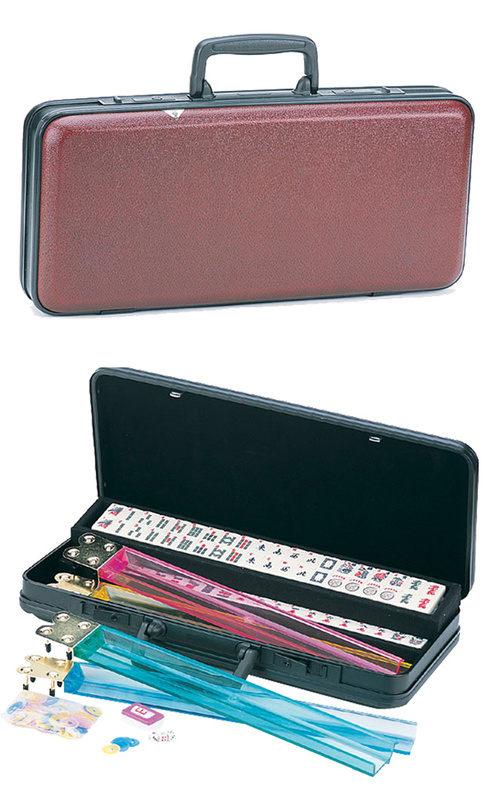 This Mah Jong attache case is available in the colors shown below.